Eddie Torres is sitting in a Brooklyn bar, nursing a seltzer and nothing else — not now. He is a trucker from Bayonne, N.J., looking around at the hipsters in their designer rubber boots, and he is trying to buy a drink for the one man who looked at him when he came in. He understands he has to entertain, or no one will listen to him. “That life is good. The road. Sky. The scenery. 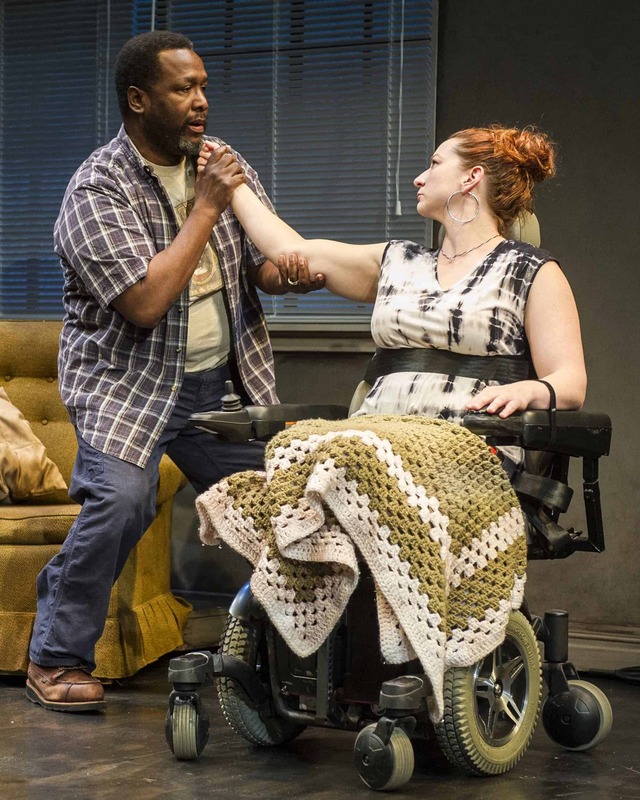 Except the loneliness,” Wendell Pierce (known as detective Bunk Moreland in “The Wire”) says as Eddie in “Cost of Living,” Martyna Majok’s new play premiering at Williamstown Theatre Festival through July 10 in Williamstown. Eddie and his wife, Ani (Katy Sullivan), have separated, but not long ago she suffered a serious spinal injury in a car accident. Not far away, John (Gregg Mozgala), a wealthy graduate student with cerebral palsy, hires Jess (Rebecca Naomi Jones) as a personal care attendant. Just out of college, Jess is working late night shifts at a bar and getting up before sunrise to help John take a shower and prepare for the day. Majok knows Jess’s world from the inside. She has become known for clear, spare, vivid writing, often touching on class disconnection, poverty and love. She and her mother came to the U.S. from Poland when Majok was young. She knows Jess’s late-night shifts and Jersey neighborhood and the pressure of uncertainty. She has seen her plays performed from coast to coast, from the Manhattan Theatre Club to the John F. Kennedy Center, and she has taught playwriting at Williams College, among others. But recognition and awards have come recently. In 2014, when Majok and her husband moved to New York City, they lived in 13 apartments — within a year. She was working at a bar until she lost her job on a Saturday, and she sat down and wrote Eddie’s opening monolog. Two months later, she was temping and working with Ensemble Studio Theatre, for a festival of new plays, and they asked her to take on the theme of work. She has been a personal care attendant for two men with disabilities, and she drew on that background for a short play. It grew over the course of a year, she said, as she dipped in and out of short pieces and heard them speak to each other. She brought the merging stories of these two couples to Dorset Theatre Festival in Vermont last June for a work-in-progress reading, and by last fall “Cost of Living” had taken shape as a conflict drawing on what people take from each other, and what they give. Mozgala has played John since the first short play, Majok said, and he told her for John climbing a stair is an impossibility, but many things are not. John is an intelligent, beautiful and charismatic man with quick wit and substantial resources. Jess, like Eddie, comes from Bayonne, a worn-down industrial city near Majok’s former hometown, Kearny, N.J. And like Eddie, she knows loneliness. Jess has family at a distance. She works to help them, but she cannot be with them, and that is deeply important, Majok said. Her mother worked for many years to support family and friends in Poland and in the U.S.
That desire vibrates in the character of Ani as she adapts with vigor and humor to her changed body, and in Eddie as he reaches out to her after all that has gone on between them for better or for worse. “I love writing characters with a deep history between them,” Majok said. John and Jess are just beginning to get to know each other, but Eddie and Ani have had 20 years together. They have hurt each other, and they know each other. That past charges their meeting now and any contact Ani will allow. She emphasized that vulnerability and strength come together. All of her characters fiercely want to live and shape their lives. Sitting in Williamstown rehearsals in the wake of the Orlando shootings, she has found herself thinking about the idea of moving forward, she said, and about caregiving in a direct and simple sense.